concerns Friday from tenants at the Bay View Apts. “Everyday I open my door to check and see if there’s a eviction notice,” said Alameda renter Julia Balthasar. Just five days before Christmas, Balthasar found an unwanted holiday delivery–a 60-day eviction notice affixed to her front door, right next to a picture of Christmas tree she had placed there to celebrate the season. Two other tenants at the infamous Bay View Apartments at 470 Central Avenue also received notices to evict last Wednesday. Over the past two years, the apartment building has become both the epicenter and symbol of Alameda’s continuing housing crisis. 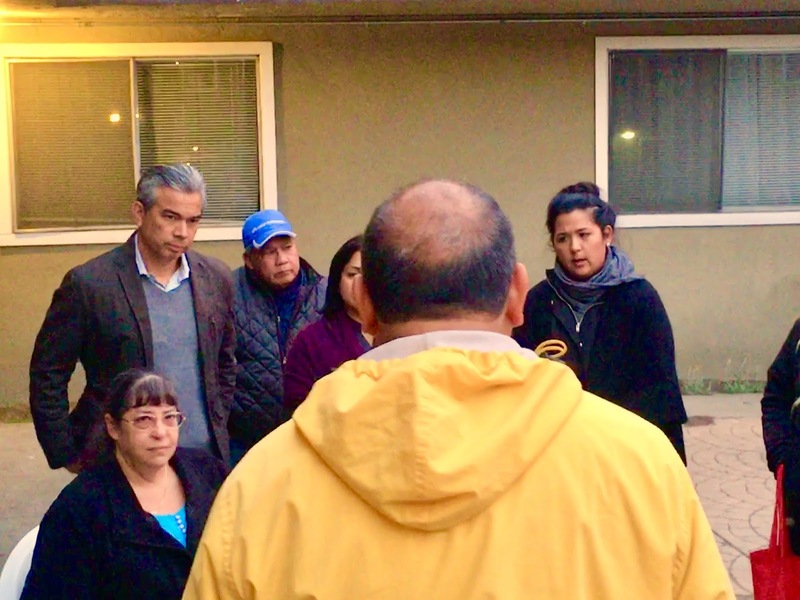 Alameda Councilmembers Jim Oddie and Malia Vella, along with Assemblymember Rob Bonta met with 470 Central residents early Friday evening to discuss the latest action. Foremost in their minds was the timing of the notices. Since November 2015, tenants at the apartment building have faced several waves of eviction notices from Sridhar and his San Jose-based equity firm. The initial attempt to evict the entire building was a large factor in the city placing a moratorium on evictions, and then, later, approving a rent stabilization ordinance in March 2016. Last Wednesday’s order is legal under the current ordinance. Landlords who plan capital improvements to their properties are allowed to evict up to 10 percent of the total number of units within a 12-month period. The Alameda City Council last June, however, amended the rent ordinance to include just cause protections for renters. In other words, the addition prohibits landlords from evicting tenants without a specific reason. Alameda landlords responded by quickly mobilizing and then successfully qualified a ballot measure for next year to overturn the decision. But rather than fight a costly campaign, the council rescinded the amendment last summer. “If there was just cause evictions this wouldn’t be happening,” said Oddie. In addition to Balthasar, another family learned of their eviction notice just as they were leaving for Christmas vacation with family in the Philippines. Tenants told elected officials Friday that they fear further rounds of evictions are inevitable. Some urged for an emergency moratorium on evictions. Support on the council for such an action, though, may be difficult achieve. Four votes out of five are needed for a moratorium, while only two, possibly three, councilmembers have typically supported the cause of Alameda renters in the past. Posted in 470 Central, Bay View Apartments, evictions, just cause, landlords, Malia Vella, Matt Sridhar, moratorium, no cause evicitons, rent stabilization, renters, Rob Bonta. Bookmark the permalink. If the Tenants actually believe that City Hall actually cares about them, then they are in for the shock of a lifetime. City Hall cares only about getting re-elected and ensuring the maximum amount of revenue from taxes, fines and permit fees. The Landlord has bought and paid for the infrastructure to boot the tenants out and on to the street. Concerning the post of 8:11PM. Are you actually convinced that the typical Bay area politician is not a real liberal, but instead only a phony, fraud, weasel, charlatan, demagogue, parasite, and bloodsucking leech who only pretends to be a great liberal and wonderful humanitarian? In fact, we should add an amendment to the US Constitution that would institute an “improved” form of “free speech” which would make it illegal to make any insulting or derogatory remarks about any Bay area demagogue politician who pretends to be a great liberal. The children are going to be torn from their homes, schools and familiar surroundings. They will have to suffer indignities that those from more privileged families will never have to endure. There is a societal cost incurred from those seeking to maximize profits. In general, the West End is experiencing a high level of real estate speculation with major apartment complexes being bought and sold. Those affected may suffer dislocation that leads to physical and behavioral problems for themselves and their children. Every homeless, abused and drug addicted person you see on the streets has a story to tell. We are ushering in the next wave of victims. MW, I do not know how to break this to you, but all politicians are phony, fraudulent charlatans who are demagogues of parasitism preying on the festering bodies of the Taxpayer Body Politic. I would not call them weasels. I have two ferrets, which are illegal in California but I have them anyway and I would not want to defame them by including them with such ilk as taxpayers, voters or elected representatives. In short weasels are adept at getting out of almost any situation and do so with skill, honor, and humor. Politicians get out of almost any situation by doing what they are paid to do by the folks that bought them. Not the ones who voted for them. Of course no one in the press dares to tell the truth, least of all our boy Steve. Yes he raises good stories but he is afraid to dig in and expose the evilness in most of the folks he writes about. I do not see much future without a free press. That being said, this is better than Fox. Anonymous, not sure where you live or where you pay your taxes. If you live in the West End then you should begin to appreciate the beauty of Capitalism. If you own your property then you should be applauding the gentrification and speculation and the profit taking that will begin the transformation of Alameda. More folks with families moving in and buying property thereby displacing the old, young, renting, dependent, infirm, uneducated, non-voting and forcing them out and on to the streets is what America and Alameda should be about. With greater speculation you get higher taxes, more ownership, fewer renters, better police, better judges, better courts, more lawyers, and better jails in the county not in Alameda. The Homeless, Abused, Drug Addict, Alcoholic, Schizophrenic and other Space Cases who walk our streets should continue to do so until someone other than those of us in Alameda figures out what to do with them. Long ago we spent tax dollars to lock them up and keep them out of site. Pretty soon we will start to do the same thing for the simple reason we do not want to pay for them to live in our world where they cannot earn their keep. Both. They received a notice (5) days prior to Christmas to leave their units by Feb. 20th. To the o'mordha if you really feel that out of the area money coming in and forcing out long time residents who may not be in your socio economic circle is healthy capitalism I will say a prayer for your soul. I think that Capitalism has no soul and needs none. The fact that there long term residents who cannot continue to live in our Glorious Bay Area is merely God deciding who shall continue here or in the hereafter. My Soul is fine, but you are welcome prey with the rest on it. Mammon was not thought well of by Jesus and the early Church, If Long Term residents can no longer afford to live here then it is OK by me that they leave or starve on the streets. God has granted no special entitlements to Alameda. It has taken far too long since the passing of the military udder to begin to start the renascence of Alameda. Capitalism does not care a lick for your soul or mine. Capitalism is about amassing Capital and let the Bourgeoisie feast at the sideboard. The Proletariat has no real stake on the island except in their service role. Is the emphasis on Christmas (rather than the Feb 20 date) in the headline, or the statement “This is unfucking-believable….Who does this five days before Christmas?”, intended as indirect commentary on Mr. Sridhar's religion or his “out of the area” status?